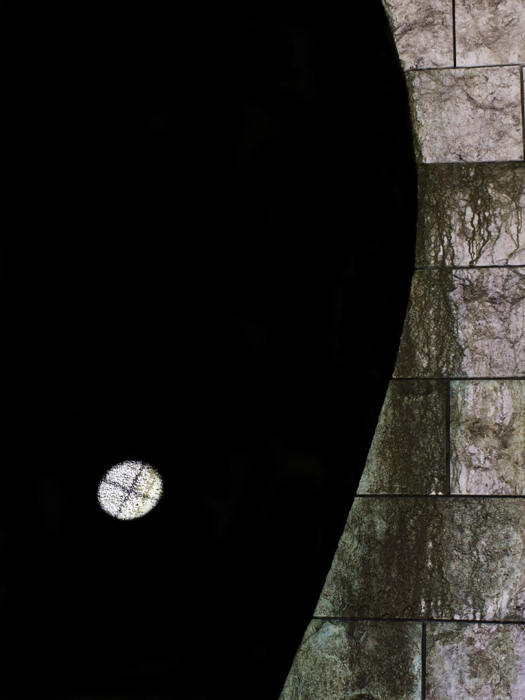 I was walking past a wall of stone when I noticed a spot of white in the darkness of an adjoining alcove. The curving architecture of the wall was very interesting. And I really liked the complementary coloration and streaking on the blocks of stone. Juxtaposed with the alcove and its dot of white, it made for a striking composition. Wishing to highlight the shapes and contrasts, I painted the alcove to full black later, during the process of envisioning the art as a finished piece. I also moved the white spot a few inches, because I liked the visual balance of that locale better. I call this image “Moonrise” because it reminds me of Anazazi architecture of New Mexico, at night, when the moon is rising.